DePaul’s Division of Enrollment Management and Marketing has just published the 2012 Enrollment Summary booklet (as a PDF). The Master of Science in Accountancy Online Program launched this year. The MSA prepares students for a career in accounting by providing a formal integrated sequence of courses which emphasize topics that are relevant to the work of a professional accountant, including the competencies required for successful preparation for the CPA Examination. Study at your own pace—any hour of the day, from any place in the world with Internet access. 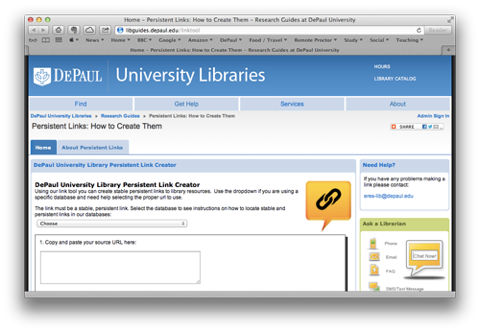 Modular content, with video lectures, online quizzes, online exams, and rich discussion. Courses are taught by top-ranked faculty with a commitment to teaching excellence and innovation. Faculty include former and current high-level working professionals from a network of accounting firms. The MSA degree requires the completion of 15 courses. Students who have not already taken introductory accounting at the undergraduate level are also expected to complete ACC 500 Financial Accounting. *In addition, students complete one elective course which may be completed at any time. A list of course options will be provided ahead of time. Each MSA course is 4.0 quarter credits, except for ACC 640 which is 5.0 quarter credits. The 2012-13 tuition rate is $935 per credit hour. For tuition details visit www.studentaccounts.depaul.edu. Kate Stevenson has started a new site for our intern students to talk about their experiences. 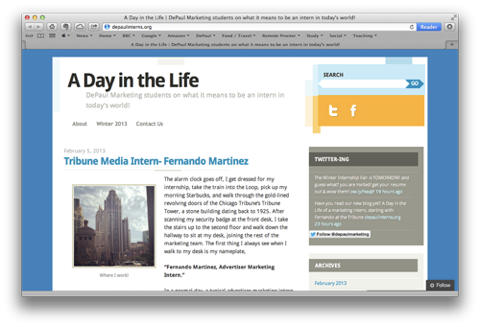 It’s called “A Day in the Life” and the site lets DePaul interns blog about what their jobs are like. The goal is to feature these students and share with other students what an internship entails. All interns will be featured in the site. Each quarter a new crop of students will be able to express their thoughts. Fernando Martinez, now at the Tribune, is the first student featured. Others will follow.